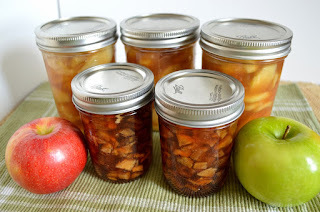 Last weekend, the Topeka Capital-Journal ran my recipes for Apple-Maple Jam and Home-Canned Apple Pie Filling. They were such a hit I wanted to share them here as well. The pie filling recipe calls for Clear Jel, a modified corn starch that works as a thickener but is made to withstand the heat of canning. I couldn’t find it in a local store, so I ordered it on Amazon. Be sure to get the regular variety, not instant. I’ve heard you can use equal amounts of flour as a thickener, but supposedly it creates a cloudy filling. I’ve enjoyed the jam on my PB&J sandwiches, and the pie filling is so much better than the store-bought kind. Thinking ahead, these would also make great Christmas gifts. Prepare jars: Wash jars, lids, and rings. Place empty jars without lids into boiling-water canner filled with simmering water. Keep the jars in the hot water until ready to use. To make the jam: Peel, core and dice the apples into cold water with lemon juice to prevent the apples from turning brown. You will need 12 cups of diced apples. Place a small plate into the freezer. Drain the apples and place them into a large pot. Add the remaining ingredients. Bring to a boil over medium heat, stirring often to prevent sticking. Keep stirring and boil for 20 minutes. Take the plate out of the freezer and drop a small amount of the jam on top. Use your finger to test how well it gels. If it has gelled enough, turn off the burner. If not, keep boiling and test every 5 minutes until ready, up to 30 minutes. When ready, turn off the heat. Take a jar out of the water and drain. Ladle in the hot jam (a funnel helps) to about 1/4-inch from the top. Wipe the rim of the jar with a damp paper towel to clean off any drips. Place a flat lid on top and screw on a ring. Repeat until all of the jars are filled. Place the jars into the canner. Make sure the water covers the jars by at least 1 to 2 inches. Place the lid on the canner, bring back to a boil, and process for 10 minutes. Then turn off the heat, remove the lid, and allow the jars to stand in the hot water for 5 additional minutes. Remove the jars from the canner and place on a towel to cool completely. You will hear the lids start to pop almost immediately as they cool and seal. After 12 to 24 hours, check the seal on the cooled jars by pressing on the lid. If it springs back, the jar is not sealed. Or remove the ring and make sure the flat lid is stuck tight to the jar. If the jar is not sealed, the jam is still good. Just store the unsealed jar in the refrigerator. Also refrigerate any jar after opening. 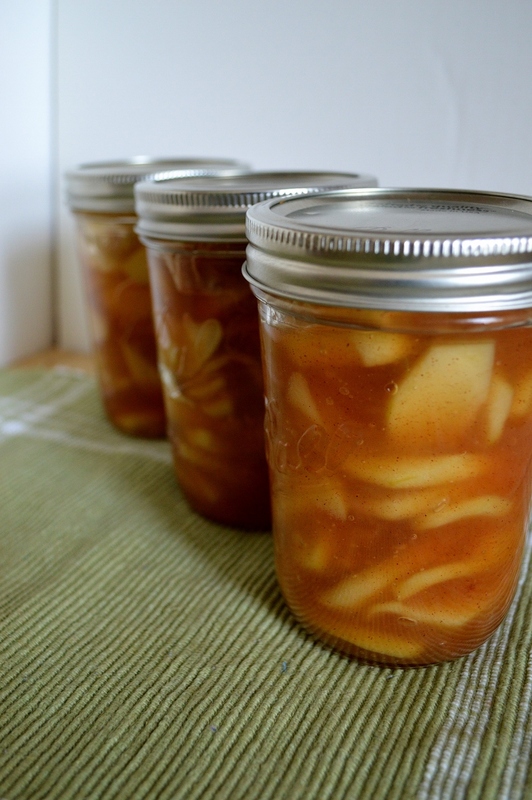 This recipe calls for Clear Jel, a modified corn starch that works as a thickener but is made to withstand the heat of canning. Be sure to use the regular variety, not instant. I could not find it in local grocery stores, so I ordered it from Amazon. To make the jam: Peel, core and slice the apples into cold water with lemon juice to prevent the apples from turning brown. You will need 12 cups of apples. Bring a large pot of water to a boil. Drain the apple slices and blanch them in the boiling water for 1 minute. Remove from the water with a slotted spoon. Rinse with cold water to stop the cooking process. Set aside. In a large pot, add the apple cider and water. Whisk in the sugar, Clear Jel, spices and salt. Bring to a boil, stirring constantly with a wooden spoon. The mixture will thicken almost immediately. Mix in the lemon juice. Remove from the heat and stir in the apple slices. Take a jar out of the water and drain. Ladle in the pie filling (a funnel helps) to about 1 1/4-inch from the top. Remove air bubbles with a wooden skewer or plastic knife. Wipe the rim of the jar with a damp paper towel to clean off any drips. Place a flat lid on top and screw on a ring. Repeat until all of the jars are filled. Place the jars into the canner. Make sure the water covers the jars by at least 1 to 2 inches. Place the lid on the canner, bring back to a boil, and process for 25 minutes. Turn off the heat, remove the lid, and allow the jars to stand in the water an additional 10 minutes. Remove the jars from the canner and place on a towel to cool completely. You will hear the lids start to pop as they cool and seal. 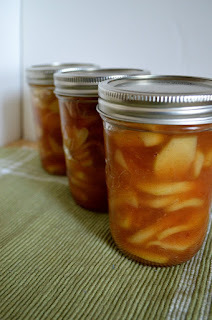 After 12 to 24 hours, check the seal on the cooled jars by pressing on the lid. If it springs back, the jar is not sealed. Or remove the ring and make sure the flat lid is stuck tight to the jar. If the jar is not sealed, the filling is still good. Just store the unsealed jar in the refrigerator. Also refrigerate any jar after opening. For a 9-inch pie, you will need to use 3 pints of pie filling. Kudos to you for checking out that recipe to the fullest. 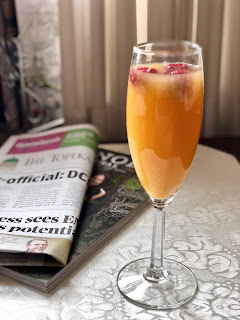 I learned the "messy" way making strawberry freezer jam a couple of weeks ago. 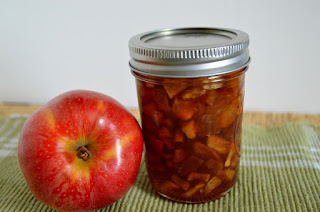 I've never tried my hand at apple maple jam but as you said, Apple season is around the corner. Maybe I should give it a try.